The inner cell mass (ICM) forms within the blastocyst, prior to its implantation within the uterus. The ICM is a cellular mass on one side of the hollow interior of the round embryo, the outer layer of which is called the trophoblast. 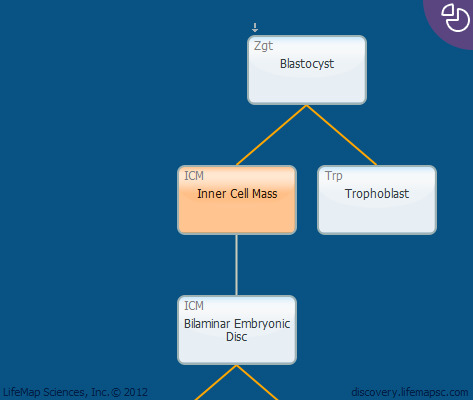 The ICM is the only pluripotent cell lineage in the blastocyst. The ICM forms the epiblast and hypoblast layers, which develop into to the embryonic tissues and extraembryonic tissues, respectively. The ICM cells are considered to be naive ground state omnipotent stem cells, with high clonogenicity, capability of forming chimeras and teratomas. These cells would typically have two activated X chromosomes in female embryos. The cells will eventually develop into the whole embryo and some extraembryonic structures. Embryonic stem (ES) cells are traditionally thought to originate in the ICM and retain its cardinal features (pluripotency, high proliferation and most of the transcriptional regulatory networks). This view has recently been challenged, as differences between naive ground state cells and primed cells are being discovered. Human ES cells are now thought to represent later epiblast stages and not ICM cells.